CAED Advising Center strives to provide its students with effective academic advising in an encouraging atmosphere as they navigate their unique undergraduate professional experiences. Our commitment is to our students and their academic, professional, and future success. We believe in an Open Door Policy to encourage students to utilize the Advising Center without an appointment to discuss any matter of importance they may have. The CAED Advising Center provides academic advising and related services as listed below to students in the five majors in the CAED (Architecture, Architectural Engineering, City & Regional Planning, Construction Management and Landscape Architecture). Process student-related forms such as curriculum substitution, course withdrawal, course conflict, change of major, etc. An undergraduate student is automatically placed on academic probation when his or her grade point average drops below 2.0 for the current term, the Cal Poly cumulative, or the higher education cumulative. Visit the CAED Academic Probation Page for more information. 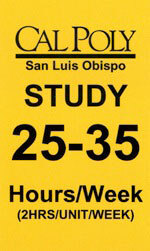 The College of Architecture and Environmental Design Advising Center supports the "Study 25-35 Hours per Week" program. Academic success is your responsibility, in class and out of class. You must approach your coursework as a 40-50 hour work week. Study 2 hours/week/unit or 25-35 hours in addition to in class time. Lab/ studio courses sometimes entails additional out-of-class expectations.